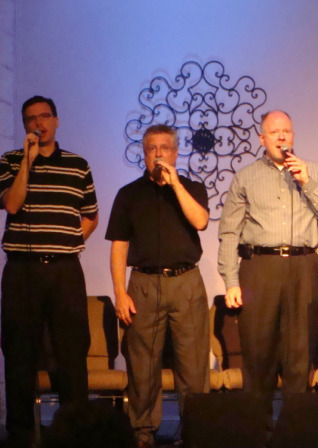 CrossBridge Church, Birmingham, Alabama / Worship / Interested In Singing? LifeSong is the worship ministry of CrossBridge. LifeSong’s purpose is to lead the Lord’s people in glorifying God (Romans 15:11), edifying the family of believers (Hebrews 2:12), and evangelizing nonbelievers who come into our presence (1 Corinthians 14:24-25). Almost no better opportunity exists to make a positive statement for Christ and for His church than in our main worship assemblies. All activities are geared to encourage the active participation of every worshipper in truth and in spirit (1 Corinthians 14:15). As LifeSong, we lead worshipers into the throne room of God to encounter His manifest presence, lift Him up in praise, and be forever changed by the experience of His nearness. We will magnify, exalt and honor the King of Heaven, the only true God, for what He has done, is doing and will do for us. We will acknowledge Him as our Creator, individually and collectively, surrendering ourselves to Him in honest worship, praise and living. We will embrace the guidance of the Holy Spirit and the inspired Word as touchstones of our continual pursuit of the Father. We will boldly proclaim the life, death and resurrection of Jesus Christ as the foundation of our faith. We will seek the Lord in love, understanding it is He who calls us. We will accept each other in love, returning to the Lord the unique gifts and virtues He has given each of us. We will trust Him, in humble anticipation, to renew, prepare and empower us for His work, that He may be magnified in all ways and always. On any given Sunday or other worship opportunity LifeSong consists of eight CrossBridge members plus the worship leader. There are usually two of each part: soprano, alto, tenor, and bass. Each LifeSong member uses a hand-held microphone and faces the congregation, standing or sitting along with the rest of the congregation as fitting a given song, to each side of or behind the worship leader. At times solos, duets, or other arrangements are employed using any combination of LifeSong members. Ideally, two or more full sets of eight members are available to rotate service by service, or on some other planned schedule. This facilitates involvement by as many members as feasible, reduces the burden of participation and allows for members being out of town or other conflicts. Participating in LifeSong is a privilege and honor. Opportunities once a month or more to sing in the “up-front” LifeSong lineup. More opportunities each week in rehearsals to sing, learn new songs, re-learn old songs, experiment with new musical arrangements, and to share, enjoy one another’s company, have fun, and pray. Support, in the form of a broad range of resources. As a member of LifeSong, you will always have the ability to be prepared. Whether or not you read music, you will benefit from a large collection of training CDs, “more music” CDs with a wide range of music for potential use in CrossBridge services, updateable sheet music collections and other resources to help you learn and grow, both technically and spiritually. Opportunities to participate in special music or solos, as ability and desire warrant. Never to be embarrassed—no one will ever be intentionally embarrassed or “put on the spot” to do something for which they are not realistically prepared. Retreats to recharge spiritual and ministerial batteries. Satisfaction and the whole range of emotions that come from being part of ministry—a strong feeling of responsibility and of making a difference in peoples’ lives (in some cases an eternal difference) by directly influencing the quality of praise and worship in the Lord’s church at CrossBridge. Growth—in singing ability, in appreciation for worship and service, in love for a small group of special servants with a common gift and love of music, and in love for the Lord. Christians—people who are not perfect but who are growing in God and living lives that glorify God. Committed members of CrossBridge’s church body and committed and submitted to CrossBridge’s leadership. Committed to being a "team player" on the LifeSong praise and worship team. Called to, gifted and anointed for the praise and worship ministry. The Calling and Lifestyle - It is very important that as LifeSong members, we feel that we are "called, appointed, and anointed" to the ministry at hand. LifeSong members must be born-again believers of Christ whose lifestyles resemble that of a born-again Christian. Members must be worshipers in and out of the “up front” lineup. Anyone who has difficulty worshiping at home or in the larger congregation is not ready to be a LifeSong member. Talent, Skill, and Auditions - Although auditions are not generally required, a LifeSong member needs to have enough skill so that he or she can follow the Holy Spirit. The ability to read sheet music is not a requirement. Members should have open hearts to receive advice, correction, training, and should be committed to becoming proficiently skilled at the praise and worship ministry. One does not need to be a professional musician to worship the Lord, but God honors the discipline of additional practice and preparation. A commitment to LifeSong is a commitment to personal preparation, both for worship generally and for a given week’s lineup of songs and readings specifically. The Commitment - LifeSong members should be committed members of CrossBridge who are dedicated to its leadership. This commitment includes prayers, regular attendance, and financial support of the church. The commitment to LifeSong should be considered a major commitment, and it should not frequently be disregarded for other events. Attendance, Punctuality and Communication - Attendance and punctuality are very important for every member of LifeSong. Rehearsals and Sunday morning sound-checks are required for any service in which a member participates “up front,” unless specific alternate arrangements are made in advance. Rehearsals are strongly encouraged for those not in the “up front” lineup in a given week. In short, LifeSong members should be present for most rehearsals. Members should arrive ready to work on the designated material, and generally should plan to stay until prayer time is completed at the end of rehearsal. New songs need to have been reviewed and rehearsed individually ahead of time. Poor attendance and punctuality indicate a lack of commitment to the Lord's ministry. If at any time, you cannot attend a service or rehearsal you must notify the LifeSong ministry leader in advance if at all possible as well as identify and arrange a replacement for your part so that proper adjustments can be made. Most LifeSong communication is handled via email. As a member of LifeSong, you commit to checking your email regularly and responding to scheduling requests within the noted timeframes. If you do not have access to email, your responsibility is to let the LifeSong ministry leader know and to work out other arrangements for communications. Open communication is of vital importance. If at any time you are confused, discouraged, or unhappy with the way things may be happening you are encouraged to speak directly and promptly with the LifeSong ministry leader. New Applicants and Waiting Periods - Under most circumstances, new applicants to LifeSong will be required to attend several practices and rehearsals before being part of the “up front” lineup.